"I was in an unbuttoned mood." We have here the two most light-hearted of Beethoven's symphonies, presented in a very confident manner by Herbert von Karajan and the Berlin Philharmonic Orchestra. The First Symphony is a bridge from the classical style of Mozart and Haydn into the 19th century and the dawn of Romanticism, with good humor and charm evident everywhere. The Eighth Symphony is a work of the mature Beethoven, but still full of wit and humor. Von Karajan's interpretation of the First is a little on the heavy side to begin with; I don't quite agree with his tempi in the first two movements. They seem a little plodding and are certainly nowhere near Beethoven's controversial metronome markings for this symphony. The initial Allegro con brio doesn't seem to have very much 'brio' to it. In particular, the second movement tends to drag a shade. Von Karajan does not take the repeats in these two movements, apparently recognizing that they would be out of balance with the other two movements at these tempi. I would have preferred he quicken the pace a little and observe the repeats, but certainly there is nothing outlandish in this performance. I was much more pleased by the last two movements of the First, which move briskly. The precision of the Berlin Philharmonic on these symphonies is wonderful to behold. The runs in the Finale ordinarily give the strings fits, but they are handled here with aplomb even at the nearly reckless clip that von Karajan requires. The gem of this disc, however, is the Eighth Symphony. With the exception of what appears to be a miking error (discussed under audio), this performance is nothing but outstanding all the way through. The pace is quick and earnest without being overpowering or hurried. The pizzicati of the strings are bright and clear and work extremely well. The Scherzo is brisk without the tendency toward plodding that one hears in so many renditions. The clarity of the Finale is without equal; where most recordings turn into a mush on the rapid tremolos, every note here is distinct and precise. There is a wonderful moment in the development of the Finale where the orchestra briefly (for only about eight measures) meanders into the key of A; the timpani firmly shepherds the errant orchestra back into the home key of F. This sequence is marvelously realized on this disc, both through audio and visually; the timpani is double-exposed over the orchestra and the mixing is just perfect. This episode has never made an impression on me as much as this one has. 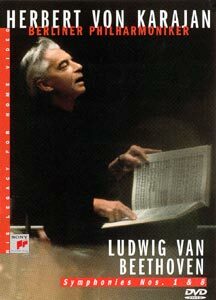 It firmly convinced me of the rightness of von Karajan's vision in preserving these performances for home video. Image Transfer Review: The image is clear and attractive throughout. As on the other volumes in this series, the color scheme is intentionally muted. However, skin tones come through quite well, as do the various shades of brown on the violins. During the Andante of the First Symphony, there is a brief episode where the first violins are in the picture, even though they are in shadow. The detail is great despite the shadow. The blacks are rich throughout. The bit rate is a solid 7+ Mbps. Audio Transfer Review: Overall, this is another terrific and involving audio mix. There is extremely solid bass in the DD 4.0 track and the presence is just a shade below spectacular. The PCM track is a bit less involving and is somewhat lacking in the bass. During its solo in the first movement of the First Symphony, the oboe gets lost in the PCM track; it is much clearer in the DD track. There is a slight tendency in the Finale of the First Symphony for the strings to get a little bit shrill in the fortissimo sections. The main problem I found was in the bassoon solo in the Finale. This brief solo is practically inaudible on both the DD and PCM tracks. If the bassoonist weren't featured in the picture visibly playing, it would be difficult to tell there should be a bassoon solo there at all. Since this is a problem on both tracks, my suspicion is that this was a miking error in the original recordings. The remainder of the Eighth comes through absolutely first class. The miking problem reduces what would be an A+ to an ordinary A; despite this drawback the 4.0 track is still an excellent mix. Extras Review: As on the other volumes in this series, the extras are light. We get the same bio of von Karajan, and a little more extensive notes on the symphonies themselves. Both bio and notes are presented in English, French and Spanish. Another winner in Sony's set of the Beethoven symphonies. The criticisms noted here are pretty minor nits. In particular, the performance of the Eighth is among the best I've heard. Very highly recommended. Mark S. Zimmer is the Project Director for The Unheard Beethoven, a nonprofit website devoted to making unrecorded Beethoven music available to the public over the internet.